MicroStation can import files from external application such as Microsoft Word and Excel. 1. Open the Excel file and Select the amount of data you want to copy. 2. From the Excel pulldown Edit>Copy. The data is copied to the clipboard. 3. 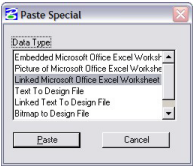 Open the MicroStation file you want to paste the Excel Sheet into. 4. From the MicroStation pulldown Edit>Paste Special. The Paste Special dialog appears. 6. Select the Paste icon. 7. In the Paste OLE Tool Settings dialog set the Method to By Size and set the appropriate scale. 8. Place a data point in the view to place the linked excel sheet. There are three ways to import the source files as pictures, embedded files, or linked files. – A picture is a screen capture of the application. The image is static and is not updated when changes are made to the source. – An embedded file is imported and saved into the DGN file. Edits made to the embedded file are saved in the DGN file. – A linked file is imported to the DGN file but still resides in the original application. Edits are made to the source file and can be updated using the MicroStation Update link tool. There is no clean solution for this in MicroStation as there isn’t anything available in the API.